Disney’s “Secret of the Wings,” the latest in the Tinkerbell franchise. Photo: Wikipedia. Recently I took my daughter Leilani to the limited engagement world premiere screening of the latest installment in the Tinkerbell franchise, “Secret of the Wings,” at the El Capitan Theater in Hollywood. To Leilani’s delight, the screening opened with a live ballet duet performance between Tinkerbell and another fairy character whose identity was yet to be revealed. At the end of the performance it snowed — yes, snowed! — inside the theater, a hint of things to come in the movie itself. Seeing “Secret of the Wings” on the big screen was quite a treat. Tinkerbell movies never receive a nationwide theatrical release. Instead they are released straight to DVD with a national broadcast premiere on the Disney channel. Yet seeing “The Secret of the Wings” convinced me that this newest rendition deserves to grace the silver screens of our local multiplexes. All the Tinkerbell films are computer generated, but this film was produced with 3D modeling, and it shows. The story of “Secret of the Wings” is charming. Tinkerbell (the voice of Mae Whitman) resides in Pixie Hollow, a hollowed-out tree trunk that acts as mission control for the earth’s warm seasons. Parents might recall that in previous films like “The Great Fairy Rescue,” the fairies there work their magic in order to make the spring blossom to life from winter and summer to shine through after that. On this new adventure, the fairies are preparing for the end of summer and the beginning of winter. Their main task is helping the animals migrate to the Winter Woods, the frosty fairy world that controls winter. The animals receive a special coat at the border as they cross, but the fairies from the warm Pixie Hollow are forbidden to cross because their delicate wings will freeze. As Tinkerbell guides the animals to the border, the prospect of exploring the Winter Woods becomes too enticing to resist. She steps across the border briefly, only to find that her wings inexplicably sparkle. Pulled back across the border by her companion, Tinkerbell is unharmed, but she is left with insatiable curiosity. Why were her wings sparkling? And what is the Winter Woods really like? Undeterred, Tinkerbell makes her way back across the border in secret, where she discovers the truth behind the sparkly wings. Ultimately it is a story of love, friendship, and, without giving too much away, rediscovering a long lost member of Tinkerbell’s family. At home on the small screen, where distractions abound (such as spilled Cheerios and potty training accidents), it can be difficult to appreciate the impressive animation of the Tinkerbell films. In this film the colors are dazzling, and the detail is remarkable, for instance, the veins on the leaves comprising Tinkerbell’s dress, or the intricacy of the snow flakes in the Winter Woods. The landscapes are stunning. This film is worthy of viewing in a single sitting. Pixie Hollow is located somewhere in England, but the star of the show, the spunky Tinkerbell, is distinctly American. She’s a go-getter, and she’s not afraid to try the stuff that’s stereotypically (and wrongly so) in boys’ domain. Her specialty is tinkering, engineering and building things with found objects and either restoring them to their original purpose or finding creative new uses for them. Tinkerbell is unstoppable and upbeat, but her curiosity and tendency to break the rules often get her into trouble. In other words, she has a little more depth than your average cartoon character, and defies the cliché of the helpless fairy tale female protagonist waiting to be rescued. Mae Whitman, most widely known for portraying Amber Holt in TV’s “Parenthood,” does a wonderfully expressive job as Tinkerbell. She’s sweet when she needs to be, and defiant at other times. Legendary Angelica Huston lends her regal voice to Queen Clarion. Another unique aspect of the Tinkerbell movies in general is the diversity of the characters. Many ethnicities are represented among Tinkerbell’s group of fairy friends, including Lucy Liu as Silvermist and Raven-Symoné as Iridessa. There is even a prominently featured full-figured fairy, Fairy Mary, and as a mom who still hasn’t made it back into her pre-pregnancy jeans, I appreciate that. “Secret of the Wings” may be the best Tinkerbell film yet. The story is charming, and even touching (at one point almost bringing a tear to my eye). It’s of special interest to girls age two to ten, but young boys might also appreciate the magical story and fun characters. Reel Mama’s rating: This movie is G all the way. I recommend it for all ages. Truly family friendly films are hard to find. This one is worth seeing. 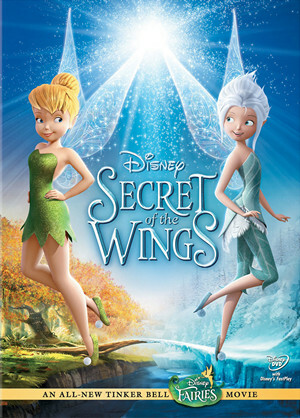 “Secret of the Wings” will be available on DVD on October 23, 2012. 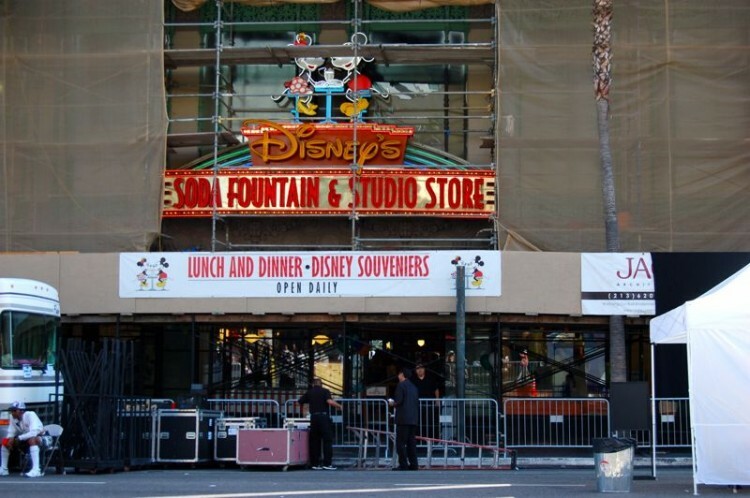 After the movie Leilani and I visited the Disney Soda Fountain and Studio Store next door to the El Capitan Theater in Hollwyood. 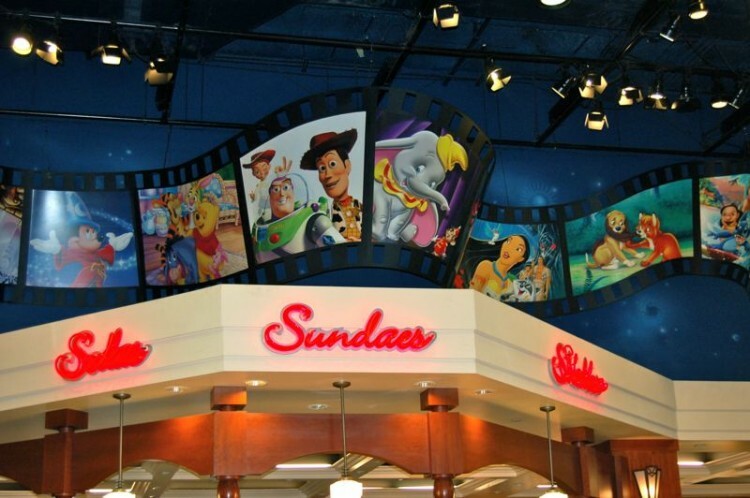 Disney Soda Fountain interior (Hollywood). Leilani and I enjoyed a ‘Secret of the Wings’-inspired sundae at the Disney sweet shoppe next door to the El Capitan Theater after the movie. Definitely sounds like something for me to watch with my girls! Before baby boy arrives! Great Review! Melissa Alexander recently posted..Do I Have To Be a Good Mom? Mommy Confessions! 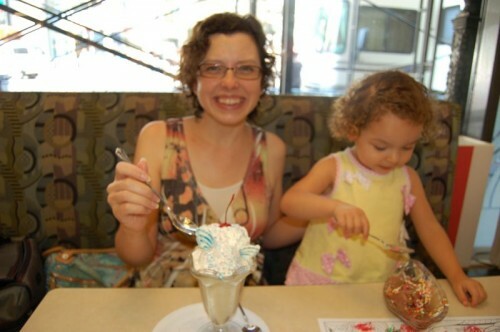 Sounds like a great day for the two of you….and the sundae looks amazing! I am so jealous! We love the Tinkerbell movies, and I’m pretty sure my daughter thinks she’s a fairy. Can’t wait to see the new one! Me too, Natasha! Tinkerbell’s a spunky sweetheart. She has guts! Love the great review. We shared it with all our facebook followers. Thank you, Rebecca! I’m so glad you enjoyed it.